Everyone wants the Norman Rockwell picture perfect turkey, but what you gain for Instagram, you lose in time, flavor and skin. Spatchcocking is simply to remove the backbone and crack the breastbone, so the whole bird lays flat. The single layer allows for faster, even cooking and all of the skin gets golden and crispy. This serious eats article goes in to far more detail and has video. Steve and I hosted Christmas eve for 25+ people and my menu included a 20 lb turkey. I knew I wanted to try spatchcocking. As I wrestled with the bird, I was grateful for the heavy duty poultry spears Mama Tsoi gave to me. Once I removed the backbone (setting it aside to make stock later) I needed to stand on a chair to get enough leverage to crack the breast bone. 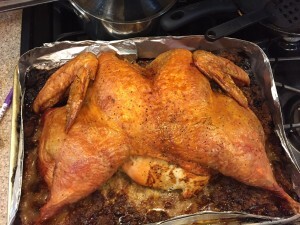 I realized immediately that the turkey was too big to fit in my roasting pan. It barely fit in a half sheet pan; I had to create sides with aluminum foil. I spread a layer of sausage stuffing on the bottom of the tray, placed the turkey on top, coated the turkey in olive oil and a generous amount of salt and pepper. I took it out of the fridge to come to room temp before cooking. The turkey took 2 hours in a 350 degree oven to reach an internal temperature of 165 (it normally takes 4 to 4.5 hours for this size bird). I allowed it to rest briefly before carving. The flatten shape made it easier to carve and I was able to get a larger amount of stuffing with the delicious turkey juices. The meat remained moist and tender and it was hard for me not to eat all the bronze skin while carving. There is no doubt I will be spatchcocking again.